Radio: WBZ 1030 AM vs. The Bruins are 6 points away from clinching the east. It's autism awareness night, benefiting the Doug Flutie Foundation. Boston: Patrice Bergeron -- Just a year and a half ago, Patrice Bergeron was nearly paralyzed and suffered a severe concussion from a hit from behind. His determination to be back by the 2008 playoffs nearly paid off, as he amazingly would have been ready to take the ice had the Bruins reached the second round last spring. This season, Bergeron suffered yet another concussion, but has since returned to approach the high-caliber level of play for which he was known before the injuries. His credo of respect and "playing the right way" is reflected in his style on the ice -- always hard, always physical, always clean. This is a really cool graph, both for what it shows about the roster and the Bruins winning/losing streaks. Kessel didn't practice this morning, will be out tonight, but should be back next week. The Lightning are the league leaders in overtime losses. Carey Price and Shane Doan are cousins. So are Phil Kessel and David Moss. 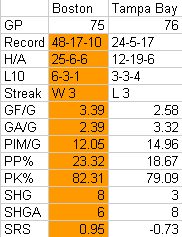 The Islanders have almost clinched the top spot in the Tavares/Hedman lottery. The Bruins signed QMJHL leading scorer Yannick Riendeu. Good prospect signing, good pickup by Chiarelli. He averaged 1.97 ppg this past year, but was over-age. Bruins official new-media guy Bish has twitter. It's the last Bru Fest, or opportunity to buy an overpriced ticket for a free beer outside the garden. The one time I went it was bitter cold, so I bet it's a lot nicer now. Final Note: It's a sad day for satire. The loss was during the slump, down in Florida. Cameron Frye: "Personally, I will be watching the game from home with a large glass of vodka filled to the tippy top." Stanley Cup of Chowder: " Bruins fans can expect to see another familiar face playing for the visiting team tonight. The Lightning recalled former Bruin Brandon Bochenski from the Norfolk Admirals." I always liked Bochenski, but he never worked out. Raw Charge: Doesn't do previews, does do open threads. WickedBruinsFan: "Looks like Manny Fernandez will be getting the start tonight." HubHockey: "Notable tonight is that the Bruins will be seeing some familiar faces tonight on the other side of the ice in former teammates Matt Lashoff and Martins Karsums who were both involved in the deal that brought Mark Recchi to Beantown"
The Bear Cave: "Karsums has two points in 12 games, while Lashoff has five points in seven contests." Matt Kalman: "Steven Stamkos has found his game with 19-22-41 totals and veteran forwards Vinny Lecavalier and Martin St. Louis have both reached 25 goals for the sixth straight season." I am well aware that Tampa Bay has 35, not 5, losses.